I really dig Hill Harper. He's a smart guy and a good actor who seems to have his head on straight. Despite this, folks don't really seem to know much about the other stuff he has going on. In addition to acting on CSI:NY, Hill owns a hotel in New Orleans, a steakhouse in Beverly Hills and for the past few years he's added book author to the neverending list of his Renaissance. First there was "Letter's to a Young Brother" and then he followed that up with "Letter's to a Young Sister," both were New York Times best sellers. 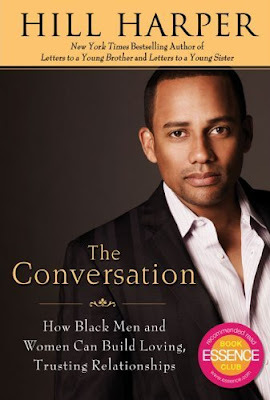 His latest book, "The Conversation: How Black Men and Women Can Build Trusting Relationships" is about to be released next month on September 8. Harper says the dynamics of being in a relationship can be so complex, but dialogue can bring together a better understanding between men and women. Click the pic above to pre-order a copy. Kudos to Hill for all that he is doing for the black community. He is a true Renaissance man.